Each year, I strive for big impact holiday cards. I don’ t mean the biggest or the most expensive, but cards that stand out within the deluge of photo cards that arrive throughout December. My friends always ask me what my secret is, and now you’ll know! Having stand out holiday cards has always been important to me. If you think about it, holiday cards are like a little gift you give your friends. Consider them that way. Yes, you want your friends to see your family, hear your latest news, and see how you’ve all grown and changed. But, that isn’t all. Your holiday card should include heart felt holiday wishes to the recipients beyond a traditional family photo, and a list of what you’ve done this year. 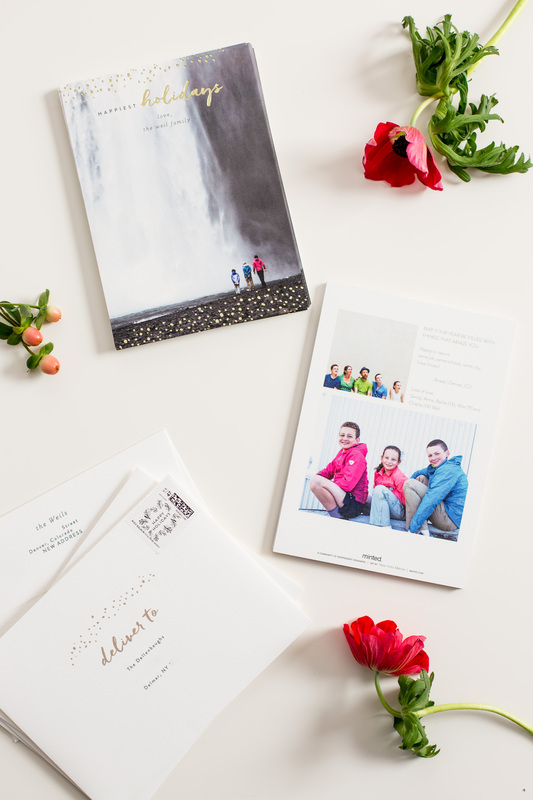 This post is in partnership with Minted, which was easy. I’ve been doing my cards with them for years! 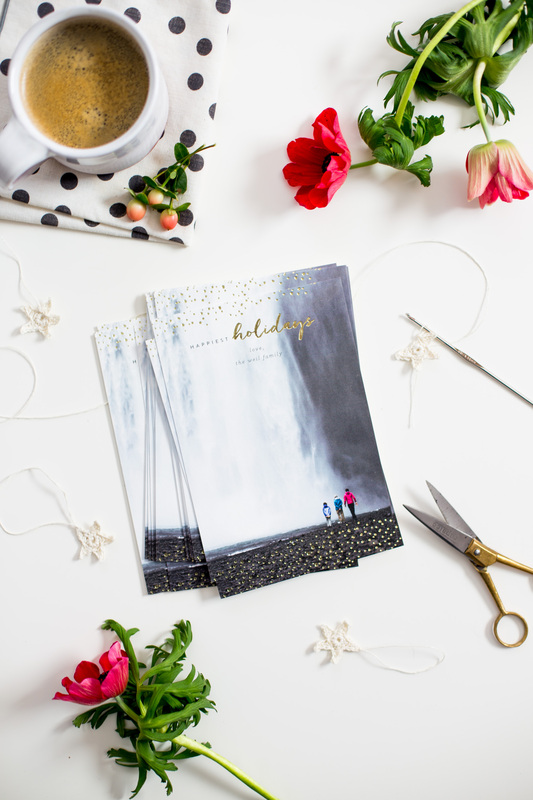 Everything about their process, design and quality makes achieving amazing holiday cards easier! 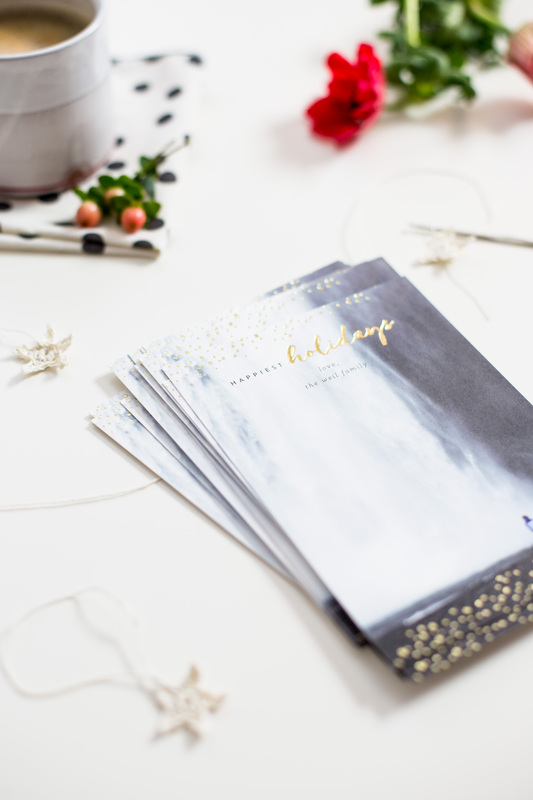 Here, I share my five tips for big impact holiday cards that get noticed! 1. Pick an unusual photo. Most people see an endless stream of holiday cards in their mailbox. If your photo includes your family smiling straight at the camera with your arms around each other, your card will simply blend in with the others. Try taking one your beautiful vacation shots, or one with your kids posed in an interesting way (on the ground, in the distance, or on their favorite jungle gym). Have a photo that makes people want to look closer. Minted makes it easy to choose a great photo, as you can upload everything from your computer and play around with the photos you’re considering. 2. Choose a striking design that compliments your photo. The next most important element of a great holiday card is matching the card design to your photo so they compliment and highlight one another. Minted is the best for this because they have a HUGE selection of beautiful designs created by a global community of independent designers. You’ll find choices in different colors, shapes and sizes, so you can select the perfect fit for your photo. Make an effort to pick colors that match or contrast well with colors in your photo. Or, select the design itself to compliment your photo. For example, with a little adjustment to my waterfall photo, I got the gold flecks in this design to line up with the ground in the photo just right. This gold foil sparkle adds a magical feel to the card. Make sure the text of the design lands in a place where it is easy to read, as well. Minted customization tools, so you can play with the design a bit on your photo. 3. Be considerate about text. On the back, I am thoughtful about the sentiment I share. In this case, “May your year be filled with things that amaze you!” relates directly with the impactful front image of that massive waterfall. This sentiment and the photo together strike an emotional chord full of hopes for your recipient that a classic family photo may not. Also, on the back, include the close ups or more traditional photos so folks can see how the kids have grown and their nice smiles. Minted provides a selection of photo layouts for the back of your card, so you can share a lot about your family’s life or just a little. You can include just one photo or whole collage. 4. Take advantage of uploaded addresses and custom stamps. Two years ago, I finally relented to my husband’s urging that we do printed addresses. Minted makes the whole package feel so pretty, I got over needing to hand address every letter. 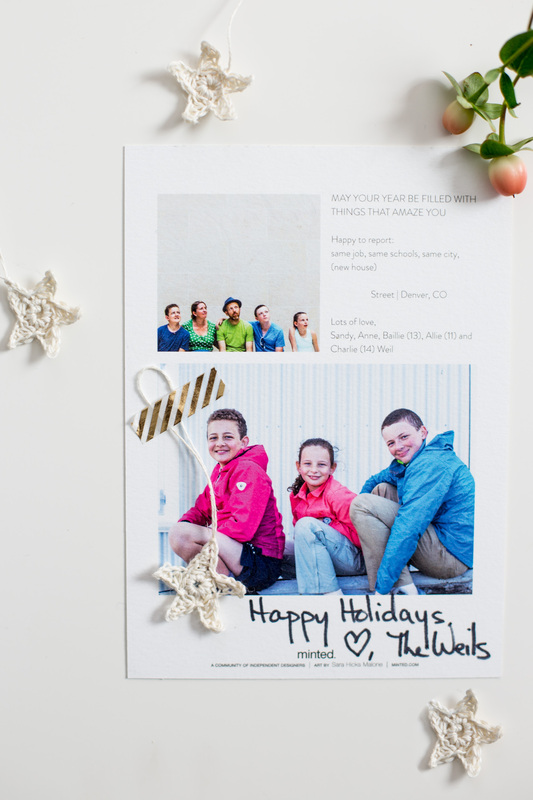 Not writing addresses makes the whole holiday card task immensely easier and faster! And, the uniform design of the whole package provides for big impact holiday cards. 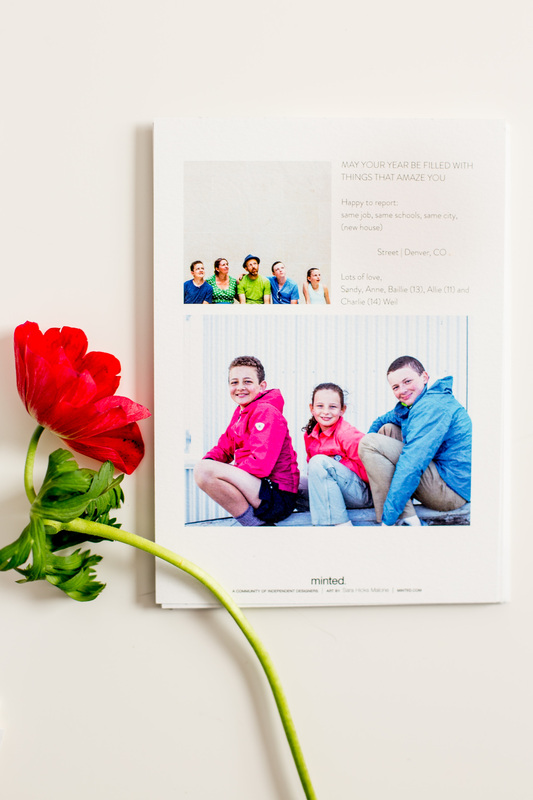 Once you upload your address list to Minted, it remains there. During the year, we keep a running list of who has moved and just update that handful of addresses or add new folks as needed. Minted even sells custom design stamps, so you get a stamp that matches your design, and you don’t have to stand in the post office line. The best!! 5. Include a small handmade gift for special recipients. For really special folks on your list, take the time to add a little something with your card. 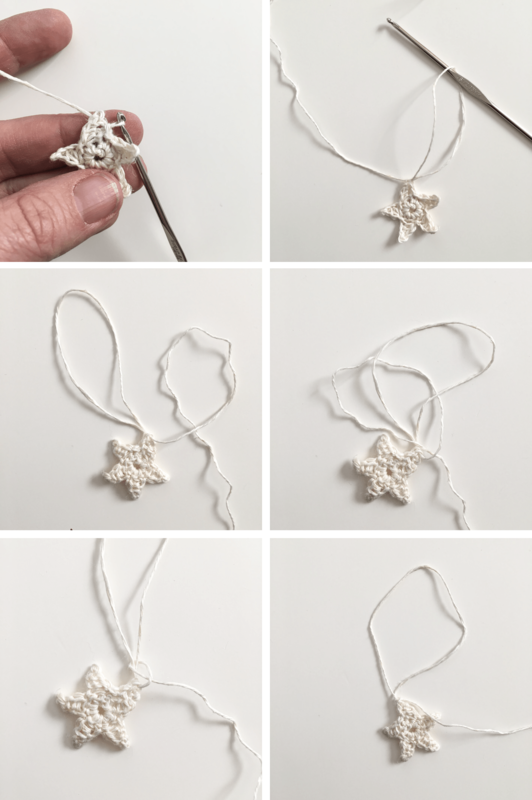 In this case, I made some hand crochet star ornaments to send to folks for their tree. Now, instead of focusing on hand addressing envelopes, I spend that time making some sweet little handmade gifts. A girl has to do something while she watches Rudolph, Frosty and Miser Brother specials! The pattern for the crochet stars is here. Below, find further instruction on how to make them into a little ornament. 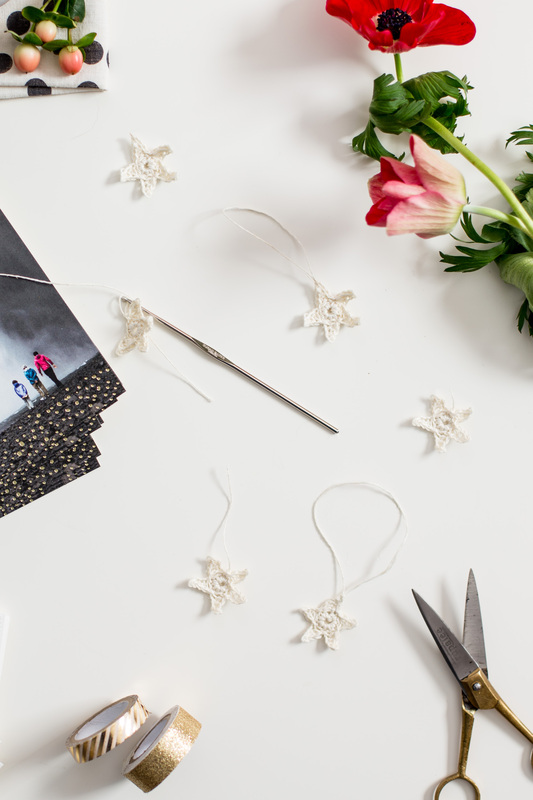 Adding a handmade gift always makes for big impact holiday cards! :: After you finish the star, slip stitch up the first point of the star. :: Instead of pulling the end through your final loop. Pull a big enough loop to hang on a tree limb. :: Half-hitch around the hanging loop by making a single loop with the tail under the strand coming from the star. :: Bring your new loop over the one coming from the star. :: Tighten, and repeat those steps for a second half hitch. :: Weave the end into the back of the star, and trim ends. Enjoy the holiday season! It sure gets busy, doesn’t it? Knock those holiday cards off your list and move on :)! Love your beautiful and original holiday cards! Hope to find a company like Minted in the Netherlands for next year. Your blog is a big inspiration to me.